Pure organic source of essential amino acids and water soluble fibre for harmonious support in gaining weight management through balancing the body's pH, reducing excessive appetite and optimising the digestive system. Rich in easily absorbed and assimilated nutrients including chlorophyll, calcium, magnesium, phosphorus, potassium and biotin. 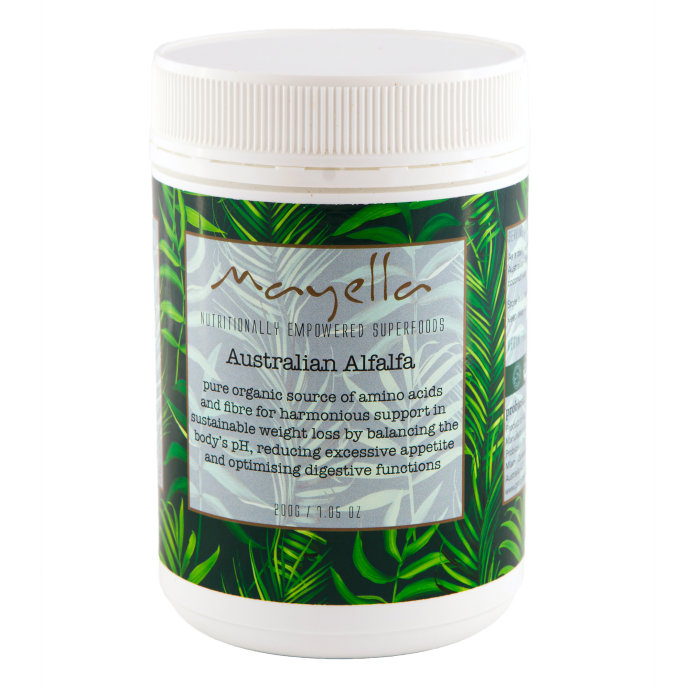 Consciously harvested to obtain optimal nutritional value, Mayella ® Australian Alfalfa is a natural whole food and daily nutritional source that is highly recommended for all women, men, teens and children. Up to ten times richer in minerals than most cereals and in a very alkaline and balanced ratio, Mayella ® Alfalfa powder supports bringing our bodies back to a harmonious rhythm of acid/alkaline with the emphasis being on alkaline. Our skin, blood, lymphatic and digestive systems benefit from the alkalising green gift of Alfalfa. Easily digested, Alfalfa’s nutrients are easily absorbed and assimilated. Alfalfa cleanses and supports the body against infection, digestive and colon disorders. Its fibre and nutritional value combined, daily enjoyment of Mayella ® Organic Alfalfa powder supports weight loss, use of stored fats as an energy source and a reduction in excessive appetite. Beneficial for those suffering with gout, arthritis, rheuma-tism, kidney and bladder complaints, fluid retention as Alfalfa is a natural anti-inflammatory, detoxifier, diuretic and is alkalising for overly acidic bodies. An ancient crop, Alfalfa’s deep roots grow almost 40 metres into the earth, absorbing rare trace minerals and making it one of nature’s richest sources of bio-available nutrients. Mayella® Australian Alfalfa is highly alkaline, benefiting intestinal absorption and beneficially balancing body pH levels. High in bioavailable chlorophyll and particularly rich as a natural soource of calcium, magnesium, phosphorus, potassium and vitamins A, B-group, C, D, E, K and biotin. Mayella ® organic Alfalfa powder is fibre dense aiding in digestion, supporting weight loss and reducing appetite, making it a useful supplement for people working with weight management programs. Take 1-2 teaspoons Mayella ® Alfalfa Grass powder daily in water, juice or in a smoothie for good health and vitality. Mayella ® Green Nutritional Blends and Single Origin powders are 100% pure, clean vegan superfoods. 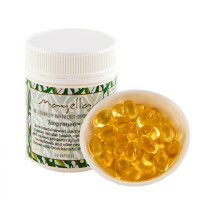 Made by us here in Australia for you with the ultimate in good health in mind. Gluten free, dairy free and no fillers, sugars or bulking agents such as maltodextrin, just concentrated whole foods as Mother Nature made them with a little help from us to get them to you, in your daily life. We source globally from the optimal geographic destinations, and it is our privilege to work with growers of fairtrade and sustainable origins. 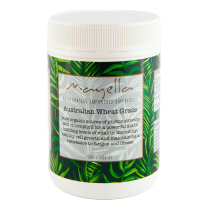 Our organic Alfalfa, Barley Grass, Wheat Grass and Oat Grass are proudly Australian grown and are the best in the world for optimal nutritional content, sustainable and clean farming practice. You will taste the healthy difference with Mayella ®. As a daily nutritional source, mix 1 – 2 teaspoons of Mayella ® Organic Australian Alfalfa into a tall glass of filtered water, natural coconut water or your favourite fruit/vegetable juice. Alternatively, take 2-5 capsules of a morning with a tall glass of filtered water. Store in a cool dry place, below 30°C / 86°F. 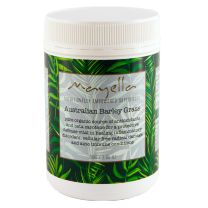 Certified Organic and Australian grown concentrated source of pure unadulterated alfalfa consciously harvested, ethically sourced and formulated with love in Australia. 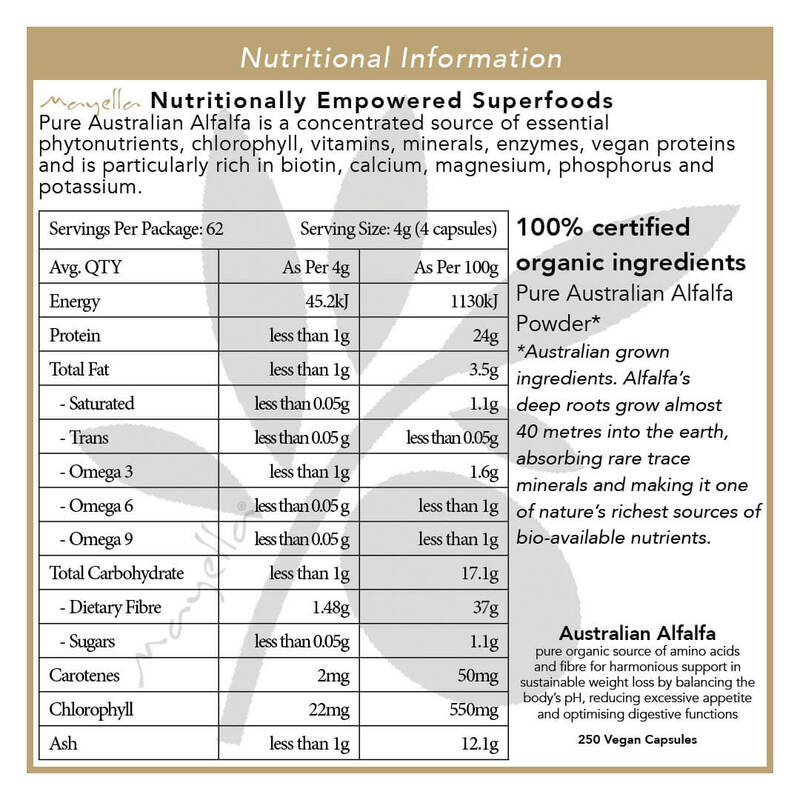 Alfalfa* – Alfalfa’s deep roots grow almost 40 metres into the earth, absorbing rare trace minerals and making it one of nature’s richest sources of bio-available nutrients. Highly alkaline benefiting intestinal absorption and beneficially balancing body pH levels. High in chlorophyll and particularly rich in calcium, magnesium, phosphorus, potassium and vitamins A, B-group, C, D, E, K and biotin. Fibre dense aiding in digestion, supporting weight loss and reducing appetite.